The long, hot summer is over (please!) and the 2016-2017 theatre season is waiting in the wings. This season I’m limiting my monthly picks to 5 (unless it’s an extraordinary month), as well as noting Northern Kentucky’s smaller stages. If you’ve never been to Over-the-Rhine’s Know Theatre – now’s the time. If you like improv, OTRimprov hosts its third annual IF Cincy with lots of national acts. (How about Chicago’s The Improvised Sondheim Project, which, of course, improvs quick, Sondheim-like musicals). Know is welcoming CCM Musical Theatre and Liz Swados’ splendid musical Runaways, focused on runaway kids, and on Mondays it will be the always-fun Serials, in which local playwrights show scripts in 15-minute installments. The season officially opens at Ensemble with local premiere The Legend of Georgia McBride, featuring two of the area’s best actors, Bruce Cromer and Michael Bath, in a winning comedy about life lessons and second-rate drag shows. The Legend of Georgia McBride, Sept 6-25. Ensemble Theatre Cincinnati, 1028 Vine St., Over-the-Rhine. 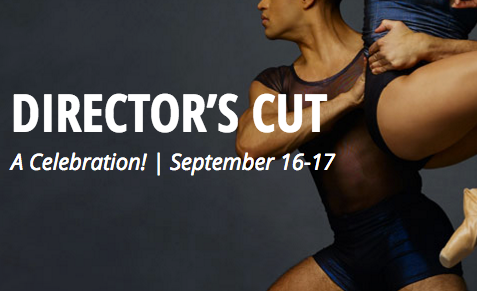 7:30 p.m. Tuesday-Thursday, 8 p.m. Friday, 2 and 8 p.m. Saturday, 2 and 7 p.m. Sunday. Tickets: $44 adults, $25 students. Preview (Sept. 6) $28. Rush tickets: $15 student and 1/2-price adult, may be purchased by phone or in person at the box office when available. 513-421-3555 and www.ensemblecincinnati.org. A young Elvis impersonator is just scraping by when, oh, no, the owner of the run-down, small-town Florida bar where he works ditches Elvis for drag. And there’s a baby on the way. The feel-good comedy some of my favorites: Bruce Cromer, sequins, Michael Bath, stilettos. Good to see Michael Carr back on stage as the guy learning to find his voice. And dance in heels. 3rd Annual Improv Festival of Cincinnati (IF Cincy), Sept. 6-11. OTRimprov, Know Theatre, 1120 Jackson St., Over-the-Rhine. Tickets Single events: $5 Tuesday, $10 Wednesday, $15 Thursday, $20 Friday and Saturday. All Access Pass: $75; Weekend Pass: $65; One Night Pass: $35 (Friday & Saturday). Complete schedule of performances and workshops at www.ifcincy.com. National improv performers headlining are: B&B (Portland, OR), Bearded Men (Minneapolis, MN), Damaged Goods (Louisville, KY), Devil’s Daughter (Chicago, IL), Fun Bags (Atlanta, GA), Human Amusements (Detroit, MI), The Improvised Sondheim Project (Chicago, IL), The League of Pointless Improvisors (Ann Arbor, MI), Orange Tuxedo (Los Angeles, CA), and Shade (Chicago, IL). LOCALS NIGHT is Sept. 8. The program includes: Patriotic Pas by artistic director Victoria Morgan, a witty world premiere duet, set to composer Morton Gould’sAmerican Salute and inspired by Principal Dancer Janessa Touchet’s unique baton twirling skills; Capricious Maneuvers, choreographed by New York City Ballet resident choreographer and soloist Justin Peck; Selections from Raymonda features the farewell performances of Principal Dancer Sarah Hairston and Senior Soloist Zack Grubbs supported by students of Cincinnati Ballet’s Otto M. Budig Academy; a new work by Ma Cong, international choreographer and resident choreographer for Tulsa Ballet (who had a hit with last season’s Mind on the (Re)Wind. Runaways, Sept. 21-25, Know Theatre. 1120 Jackson St., Over-the-Rhine. 8 p.m. Wednesday-Friday, 3 and 8 p.m. Saturday, 3 and 7:30 p.m. Sunday. Tickets $25; $10 rush seats 10 minutes before curtain when available (cash only). $5 Wednesday preview. $1 handling fee. 513-300-5669 and here. 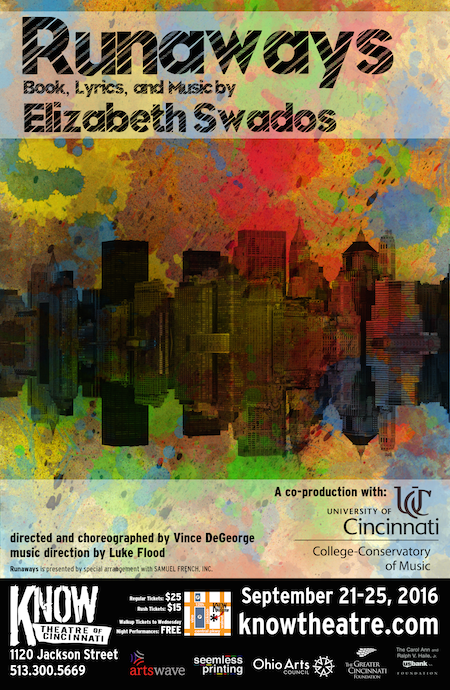 UC’s CCM-Musial Theatre kicks off its fall Studio season with an off-campus production of Liz Swados’ ground-breaking, rarely revived and still too-pertinent musical from 1978. Like A Chorus Line, Runaways was created from workshops with real-life runaway kids, often using their words, and the theme of running away "from home, from a boyfriend, from a predator... from yourself." The score mixes disco, pop, C&W, blues, jazz, hip hop, reggae and more. 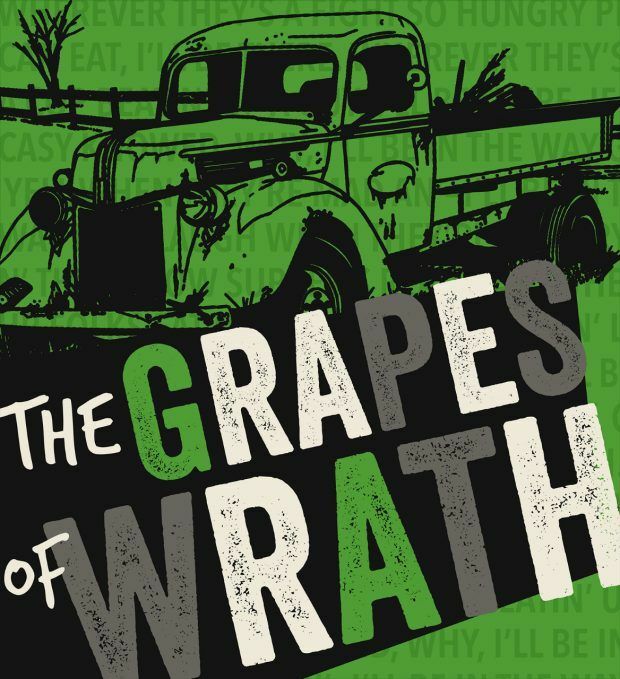 The Grapes of Wrath, Sept. 29-Oct. 9. Northern Kentucky University, Corbett Theatre. 8 p.m. Wednesday-Saturday, 3 p.m. Sunday. Tickets $14, senior citizens $11, students $8. 859-572-5464 and here. Frank Galati’s brilliant, deeply emotional, vividly theatrical stage adaptation of John Steinbeck’s novel about endurance, sacrifice, and family follows the Joad family on their flight from the dust bowl of Oklahoma to the promised land of California, confronting almost unendurable suffering long the way. Dreams are shattered but the play is an unforgettable affirmation of the indomitability of the human spirit. Hair, Sept. 8-24. Footlighters, 802 York St., Newport. 8 p.m.Thursday-Saturday, 2 p.m. Sunday. Additional 8 p.m. performance Sept. 21. Tickets $22 in advance, $23 at the door. ($1 handling fee per ticket.) 859-652-3849 and here. Jennifer and Jered Ryan direct an American classic. Set in an East Village park in 1967, Hair is the musical story of a group of hippies who celebrate peace and love in the shadow of the Vietnam War. The loose plotline centers on Berger, the charismatic leader of the "tribe," and Claude, a sweet-natured guy from Queens who's about to be drafted. The score still rocks with songs that are still groovy: "Let the Sunshine In," "Aquarius" and "Good Morning Starshine."